I have an object I'm wanting to repository that's a little different than my other ones. It's Komasutra's Art Nouveau Desk, and I want to Repository it to the Art Nouveau Bookcase. The hitch this time, is that there are 2 meshes that use the same texture: base and desktop. 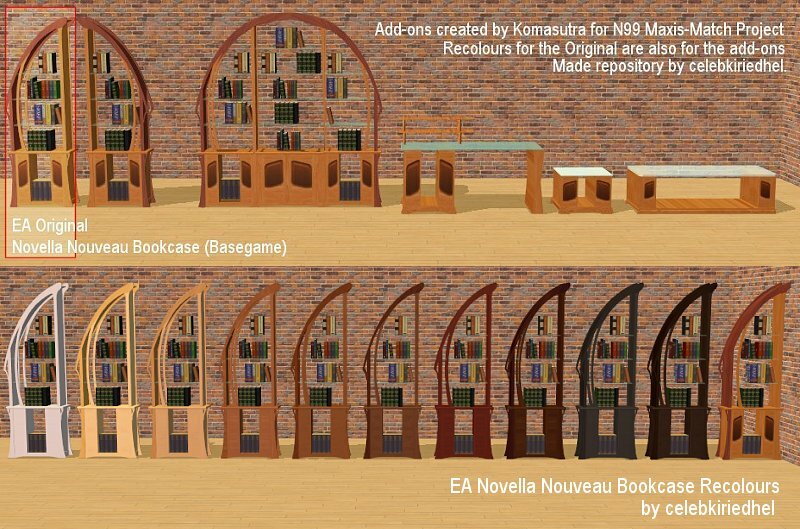 I've set up base to repository ok - changing the mesh name to the Art Nouveau Bookcase meshname. And doing all the other stuff. However... what do I need to do, to set the desktop to use the Art Nouveau Bookcase texture? Can I have two mesh names the same? I'm thinking no. In which case, how can I convince it to use the Art Nouveau one. What do I need to do, to make it go? You can allow the two meshes to have the same name in the GMDC - but with the same name you will lose a subset. Rename the desktop to base. Then repository it to the texture. Thanks for this Lee, and for all your help! Well done, Kiri! It looks great! Those are the plain recolours. I'm going to do some more complex recolours that make them way more Art Nouveau-ish. (I love Art Nouveau). RebaLynn1960, proud to be a member of LeeFish since Apr 2012.